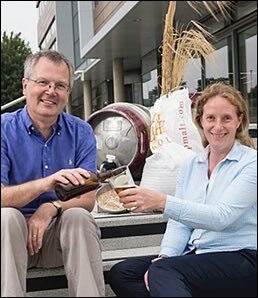 Scientists across the Atlantic have joined forces to speed up the development of malting barley for the explosion in craft brewing in the UK and US, and demand for locally-produced beer. The John Innes Centre and Michigan State University’s Upper Peninsula Research and Extension Center (UPREC) have received partnering awards to develop collaborations researching malting barley. UPREC is a leader in malting barley research in Michigan. In 2014 Dr Christopher Ridout and Dr Sarah de Vos visited the research trials in Michigan. The JIC scientists work on heritage barley lines to develop new malt flav ours and Fusarium head blight resistance. The groups received partnering award grants from the BBSRC to cement their collaboration, worth nearly £40,000. The partnership will develop the technique of genomic selection, an advanced DNA-based method to speed up the breeding process. “We were impressed by the high quality of the trials performed at UPREC, and the passion of the researchers to re-establish malting barley in the region,” said Dr Ridout. Other partners include researchers from Penn State, Cornell, Agri-Food Canada (Prince Edward Island), Virginia Tech, and Deer Creek Malting in Pennsylvania. Eastern North America is the focus of this work for its emerging malting barley and malt industries. As interest increases in malting in the east, farmers and maltsters have found it difficult to identify varieties that are well suited to a humid climate. Dr Ridout and Dr de Vos work on heritage barley lines naturally adapted to European climate. Their research will assist the emerging eastern malt industries and support a recently established start-up company, New Heritage Barley supported by a BBSRC Enterprise fellowship to Dr De Vos. The JIC scientists are also working on beneficial soil microbes that will improve malt quality and reduce inputs needed for the crop. Researchers in the Upper Peninsula have already put six UK varieties in the groundselected from a cross with Chevallier, a popular barley from the Victorian period, with resistance to Fusarium head blight. “This is a great opportunity to test our varieties in different environments, which helps us develop more durable disease resistance,” says Dr Ridout. This collaboration, made possible through the BBSRC partnering award, will open the door for additional varieties to be tested in the future and enable knowledge exchange between the partners. Early-career researchers will travel between the countries, benefitting malting barley research on both sides of the Atlantic.